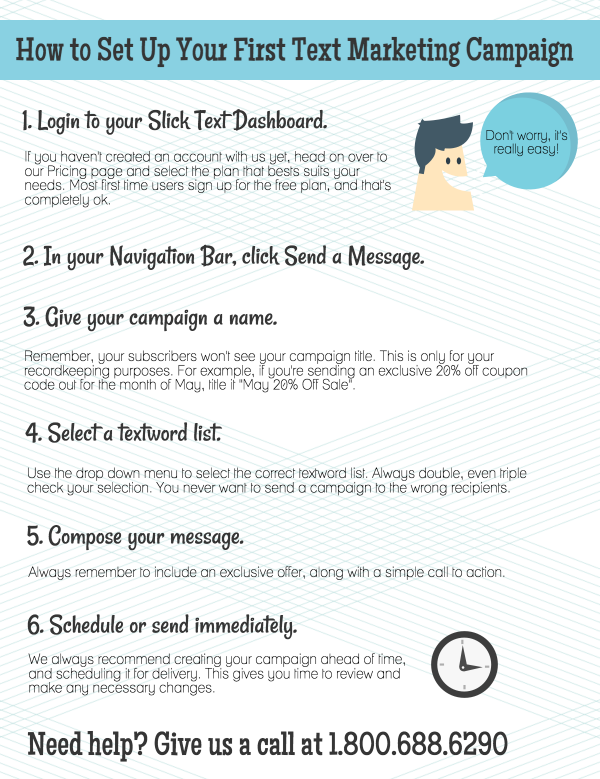 Getting ready to set up your first text message marketing campaign? Well we have news for you. Contrary to popular belief, it’s not as hard as it may seem. Sure, as a first time user, all the buttons and options in your Slick Text Dashboard might overwhelm you. That’s completely understandable. But, let’s take it one step at a time. You’re here because you want to grow your business with text message marketing, right? And we’re going to help you do just that. Follow this easy step by step guide, and you’ll be firing out successful campaigns in no time. If you have any questions, we’re just a phone call or email away. At SlickText.com, we value education and innovation. We want to make even the greenest business owners text message marketing pros. Ready to partner up with top text message marketing provider, Slicktext.com? Give us a call today at 1.800.688.6290 to set up a free plan.